Elegant haunt and gothic twang. 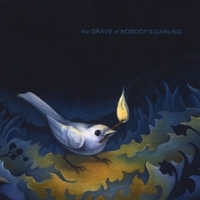 The Grave of Nobody's Darling debut album is part Cormac McCarthy, part expansive cinema. Like Patti Smith peering over a doomed South. The elegiac alt-country stardust made by the Grave of Nobody's Darling might sound effortlessly of endless highways ribboning through desert nights, but leader Jessica Billey has spent a lifetime finding that road. Singing of blind blackened eyes, blood under the ground in Kentucky, and saddling up the sky, the gothic twang of her band's FireBird's debut is part Cormac McCarthy, part expansive cinema. With recording that began, appropriately enough, on Halloween, the quartet's vibe is one of elegant haunt, refined from a half-decade of songwriting and meticulous arranging. Billey spent her childhood among the stringed instruments and bluegrass fiddlers of her grandparents' Indiana music shop, taking classical violin for 12 years before studying with Rocky Stone, a Western swing fiddler who played with mid-century staples, Old Rasmussen and His Nebraska Cornhuskers. Later, she spent a full decade as an in-demand session violinist for Chicago alt-twang staples like the Mekons and Smog, as well as a fixture in all-star outfits like the Boxhead Ensemble (featuring everybody from future Wilco drummer Glenn Kotche to chamber jazz master Ken Vandermark) and the Drag City Supersession (which counted Edith Frost and Jim O'Rourke among its partcipants). Still, it took a move to Albuquerque for the bandleader's musical horizon to open up. Before that, the Grave of Nobody's Darling had existed in various incarnations, including (in Chicago) a Western swing trio with husband Bud Melvin on banjo and Billey herself on violin, who covered Bob Wills and rearranged Morrissey. (Yeah, that Morrissey.) But, after years of singing harmony and playing violin, Billey--while exploring the eternal magic of four-track home-recording--suddenly discovered loves for both guitar and songwriting. When the Grave of Nobody's Darling rose again, it was as an electric quartet. A visual artist--her moody surrealism has graced the covers of numerous releases, as well as the front of FireBird--Billey assembled a band of sympathetic synaesthetes. Turning out arrangements that explode indie country tropes in all manners of surprise, the band's live dynamics spread into the album's corners with dark, intricate detail. While Melvin is an acclaimed 8-bit/banjo fusionist who rewires Gameboys for his own musico-political delight, his pedal steel here twists into new places: a chopped staccato on "Lake Havasu," shimmering like a plastic bag in the wind on "Laureli." Bassist Clifford Grindstaff, too, has extracurricular interests far from the proverbial heartland, recording intricate psychedelic miniatures as Ipytor Gavyen Machislav. Drummer Jill McArthur (sister of Brothers and Sisters drummer Greg McArthur), meanwhile, is an Albuquerque scene staple and alum of dearly departed local faves, the Mindy Set. Together, the Grave of Nobody's Darling take the long road. Capable of crying ghost harmonies ("Cat Music") and starry banjo-propelled floaters ("Nine Days and Nights") they are unafraid to engage in textural moodiness. Indeed, more than half the songs edge over the five-minute mark. "Kentucky," FireBird's epically building set-piece, tops off at nearly seven as its dread looms into blossom, Billey's impassioned narration crying like Patti Smith peering over a doomed South. "There's blood all under the ground in Kentucky," Billey sings, literalizing the deep, intimate vein that runs through FireBird: a darkness that springs eternal. I love this cd! Vocals are awesome. Great new sound..relaxing and calming.